Happy Monday! I hope everyone had a wonderful weekend and was able to get out and enjoy some gorgeous summer weather. I'm still back home in Wisconsin, so my family and I spent the weekend by the pool, trying to escape the humidity. It is so crazy how much of a difference humidity makes, taking a perfect sunny day from enjoyable to sweltering, Yuck! Since I have been home, it was the first time in 674 days that Wisconsin had seen temperatures above 90 degrees. I guess I brought the Texas heat with me! 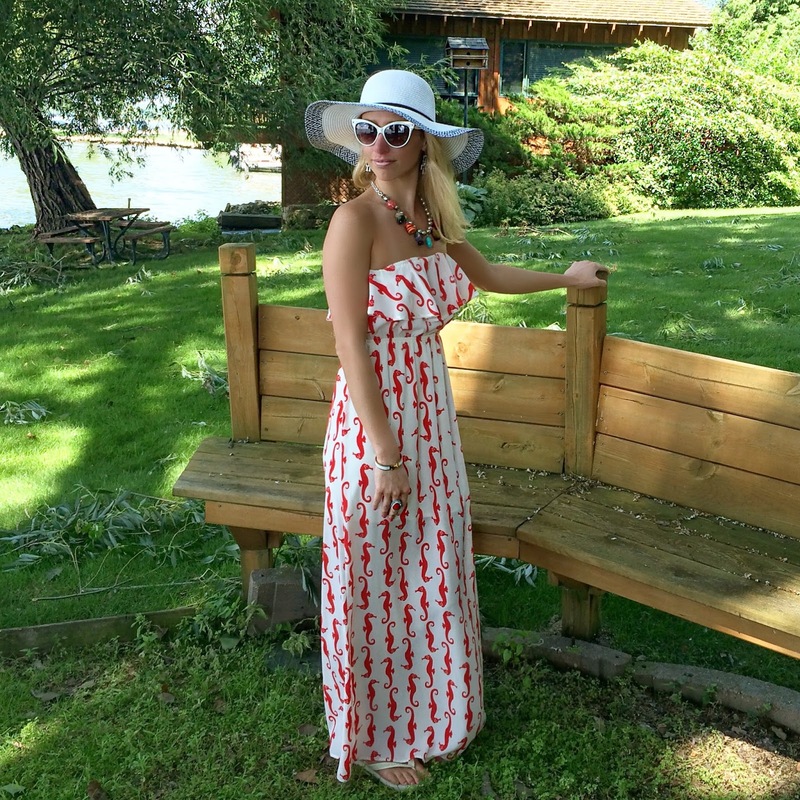 When I wasn't in my swimsuit, this seahorse dress was the perfect, easy outfit to slip on. Unfortunately it is sold out, but I did link a similar style above. The playful print makes this dress really versatile. You could wear this on a beach vacation or to a picnic, but you could also dress it up with wedges and an updo for the evening - it definitely is a great summer go-to. To complete the outfit, I added this gorgeous necklace that my mother purchased when we were in the Galapagos Islands. I love the mix of color in the necklace, and thought it helped bring out the burnt orange color of the seahorse print. During the summer you won't find me without a hat. I absolutely love hats year round, but during the summer they're critical for sun protection, and I absolutely hate having the sun on my face. I got this cute hat from Walmart recently, and love the fact that it is lightweight and bendable, which makes it easy to travel with. I hope you have a stylish week and enjoy the last few days of July...summer is almost over!